The President’s wife has gone on vacation in Spain. Total cost for her little getaway? How about $375,000? The good news is that we taxpayers aren’t paying for all of it. According to the White House press secretary Robert Gibbs, the First Lady is traveling just like any other private citizen. According to most outside accounts, Mr. Gibbs may be a bit off the mark. 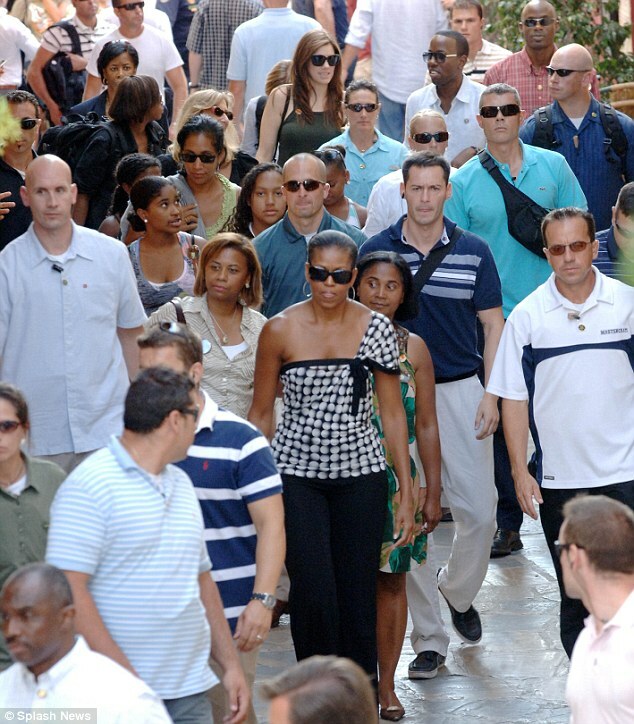 Members of the first family travel with a security detail for protection. The First Lady took her Secret Service detail (70 people) with her. She also took her personal staff and some friends. The cost is staggering, no matter who is footing the bill. It appears that such an expensive junket has garnered quite a lot of attention. It’s hard for a mother who’s having to feed her family Spam and Wal-Mart brand mac and cheese to understand that Mrs. O. is having lobster for dinner in Spain. It’s interesting to note the difference in how the two newspapers linked to above are presenting the story of the First Lady’s Spanish holiday. While the London Daily Mail questions the extravagance of this trip, the New York Times passes off the cost of the trip as a normal occurrence when the First Lady travels. I don’t recall any other first lady’s vacation being quite so expensive. While both articles mention the cost of using Air Force Two at between $140,000 and $160,000, neither mentioned the expense of hauling the special armored vehicles used to transport the First Lady and her security force. This task is handled by the Air Force at taxpayer expense. The President and First Lady are scheduled to take two more vacations this month. Their number of vacation days are not excessive when compared to any other presidency. I doubt that anyone cares how many days the first family vacations, anyway. The real question in a lot of people’s minds is how to come to grips with the amount tax dollars being spent on one getaway for the First Lady. I’d remind the first family that our nation is on the verge of going bankrupt. Maybe they should tone it down a little. That’s what you conservatives want,rich people getting richer,and blowing more of their own money. Everything just costs more now,Larry,that’s why it cost so much more than other first ladys’ vacations. Why should she suffer? She is rich, and you guys don’t think any rich people should give their money to others or share,or even tone down their lifestyles. Just because her husband happens to be the president,why should she give up her rich folk lifestyle? Yes,I think it was poor judgement,but she did, mostly,spend her own money. Plus,she is a very headstrong woman,and I don’t believe anyone could convince her to change her plans,even if it looks bad,to us poor folks. The salient point here is “blowing their OWN money.” As far as I can tell, neither the president nor his wife has ever had much in the way of an honest job. Like Bill Gates or not, the man is responsible for probably more wealth creation than anybody since Vanderbilt, and the wealth he created has been spread around to 10s of thousands of people. So when Gates blows a quarter million dollars, we know it is a quarter million dollars that he actually had to satisfy a bunch of customers in order to earn. The Obamas’ money, OTOH, is largely due to political patronage, which is the antithesis of wealth creation. The direct source of most of their personal wealth is sales of his two books, as I understand it. If you want to track back from there and find political patronage or whatever as an indirect source making the books sell, I suppose you could do that. Granted, lots of politicians make good book deals and get lots of money from them – the Clintons, for example. Even for most conservatives, it’s just a way to raise revenue, not actually create wealth. I think you know as well as I do that the only reason his books sold at all was because of his station, and he obtained his station through the Chicago political machine, hence patronage. Nobody would have given 2 figs about either one of those books if he were say, an alderman in Chicago. Most First Ladies who travel without the POTUS do so with a goodwill purpose. For example, Laura Bush traveled to Africa and other countries to speak about the plight of women,etc. I cannot imagine Laura Bush traveling with a group of friends and imposing on the Spanish royalty without having a specific goodwill intention. This is further evidence of the pompous arrogance of the Obamas. Lisa, I agree. This was a dumb stunt to pull, given the state of the economy, the unemployment rate, etc. There’s also another thing I’m intensely curious about (although it’s none of my business) — why are Michelle and one daughter off in Spain and another daughter off at summer camp (or wherever) on daddy’s birthday? I wonder if there’s trouble in paradise? Inquiring minds want to know…. Great cartoon, Brianna! I love Muir’s work.